Krimper Café is located in a laneway off Queen Street – in Guildford lane – in a converted warehouse space. When you walk down the laneway to get to Krimper Cafe, there are a bunch of wooden panels at the entrance, one of which is a door – took me a second to register how to enter the premises. Once you walk in you are transported into another world – you are greeted by a large welcoming venue that has exposed brick walls and wooden beams, together with the wooden tables – lots of wood!! as well as three hanging road bikes. This space was previously a sawmill, then a cabinet making factory and then the Guildford Lane Gallery. The centre piece of the venue is an old elevator which has been somewhat restored – there is a table located inside this elevator that a group of up to 6 people can sit at. Another key piece of the venue is the “flying saucer” lights which were sourced from op shops – which are peppered throughout the venue. The café name itself comes from furniture maker Schulim Krimper – who owner Min Soon admires as Soon is a designer and architect himself. There is a piece of Krimper’s work which is located at the café as well. Additionally each of the tables are made from an old spiral staircase that used to be located on the premises as well. Coffee here is from Proud Mary and Krimper Cafe offers house blend or single origin. The latte that I order is fantastic as expected – nutty, creamy and crisp all at the same time. Coffee perfection. The menu is short, simple but unique and has Japanese, French and American-style cooking involved. There are daily specials available as well. I was looking forward to trying the Almond Crusted French Toast but didn’t see this on the menu so decided to stick with the sweet them and ordered the Orange blossom spelt waffles, with blueberries, banana, ricotta and maple syrup. And this dish sure didn’t disappoint! The dish came out not only looking amazing but tasted even better. The dish was bursting with colours and flavours. I am generally not a fan of orange flavours but the orange blossom in the waffles was yummmm and was further complemented with the maple syrup and flavoursome fruits. Another winning component of the dish was the Ricotta which didn’t taste like ricotta at all – it tasted like a smooth vanilla tasting mascarpone – which I could eat table spoons of. I had to make sure that I didn’t gobble it down all at once. Overall it was a really great dish and made my morning! Krimper Cafe is a very welcoming, relaxing and casual cafe that is going to do great things not only for the Melbourne breakfast and brunch scene but hopefully in the nighttime as well. Currently Krimper Cafe is not opened on the weekends, but hopefully that will change soon. Eventhough Krimper Cafe is no where near my work – I will definitely be coming back. 90 Secondi – BEST PIZZA in Melbourne! I work around the Docklands area and sometimes with the guys at work we head to Ethihad Stadium at lunchtime. It was on one of these lunchtime trips that I saw a new food place opening at the bottom of the new NAB building at Ethihad Stadium near Gate 3 and mentioned to the guys at work that we need to come check it out once it opened – and we did! The brand new food place in question is 90 Secondi. This is the latest venture by Johnny Di Francesco, who is also responsible for the acclaimed 400 Gradi pizzeria in Brunswick East. 90 Secondi, is named after the traditional time needed to cook a true Neapolitan-style pizza and it certainly in my opinion is the tastiest and bestest (even if that isn’t a real word) pizza in Melbourne. Pizza here is made from a custom made wood-fire pizza open which has been shipped directly from Napoli. In fact even mozzarella di bufala (another name for buffalo mozzarella) is air freighted fresh from Caserta in Italy. If that is not authentic in terms of ingredients then I do not know what is! The basis for creation of such great tasting pizza is the oven set at 400 degrees (hence the name 400 Gradi for Di Francesco’s other restaurant) at 90 seconds (ala 90 secondi!) – if pizza is in the oven for longer than 90 seconds than it isn’t a true Neapolitan-style pizza – together with quality dough and use of fresh ingredients. We went to lunch on a Friday and lucky we made a booking, as the place quickly filled up. The place is open and modern and perfectly lit with filament light bulbs. To add to this there are timber tables, high ceilings (giving it a roomy feel) and accents of red in the form of funky chairs and cris-crossed large light fittings. There is seating both downstairs and upstairs – with a bar / coffee counter station in the middle of the downstairs section. As you walk to your table you get sight of the open kitchen and large wood fire oven where all the magic is created. When I first walked in – the first thing I saw was one of the chefs twirling the dough around to get it to that thin base – so that’s how they get the base just right! =) We were seated at our table and given the menu. The menu consists of Pizza’s mainly (duh!) but there are also dishes like zucchini flowers and meatballs under the heading Stuzzichini, Pasta dishes, Char grilled lamb ribs and a Mussel dish under the Secondi Menu, fresh salads under the Contorni e Insalate heading and of course finshing with Desserts such as Panna Cotta, Tiramasu and Nutella Calzone under Dolci. There was a unanimous decision around the table to order pizza’s as they all sounded delicious. I decided to get the Toscana pizza which came with Mushrooms, Goats Cheese, Fior di Latte and Rocket. The pizzas didnt take long to come out and when it did they looked just as good as they sounded. We all couldn’t wait to have the first bite. The crusts were thin – exactly the way that I like my pizza – lightly charred, with a light puffiness to them. The Goats Cheese and Mushroom combination with the Blanco base was oozing with flavour and deliciousness. Loved it. I also got to try the Margherita Verace – San Marzano Tomato, Mozzarella di Bufala, Basil and Parmesan. The Mozzarella di Bufala worked well with the tomato and the basil – such a simple pizza but done fantastically. They say you can tell a good pizza place if their Margherita pizza is great – so going on that – this place is the best. Other pizzas that people got was the Guancia – San Marzana Tomato, Fior di Late, Pancetta, Mushrooms, Olive and Zingara – San Marzano Tomato, Fior di Latte, Hot Salame, Rocket. Both of these pizzas as well had the same response when asked how the pizza was – they all loved it. The pizzas are quite large in size but you never see a plate that isn’t empty because why would you want to waste such great tasting pizza. The pizzas are quite filling, that you are almost left no room to try out the dessert. On another (of the many occasions that I have already been there) – I tried out the Nutella Calzone – which you can get in both Mini and Grande size. I ordered the Mini size and was surprised when it came out to see how big the Mini size was – if this was the mini size just how big is the Grande size. The dough was soft and tasty – just like the pizza dough – and was filled with warm, oozy nutella and is one to try for all the chocolate lovers. One thing I wasn’t a huge fan of was the ice-cream that came with the Calzone – but then again that could be just me. 90 Secondi is open for breakfast, lunch and dinner, and it set up to be more of a casual dining venue which is different to 400 Gradi. The idea behind the location is to target some of the footy traffic before a game, as well as the corporate people around the area. It certainly is a welcome addition to the area and really does brighten up the food scene out at Docklands. 90 Secondi is authentically Italian and serves delicious food – the staff are friendly and welcoming which is an added benefit. The coffee here is pretty damn good as well – I walked all the way around from my seat during half time at a footy game to get coffee – strong nutty and creamy flavours. Their Chai Lattes are just as tasty as well. If you love Italian and love pizzas – you definitely have to try this place out. You don’t know what you are missing. 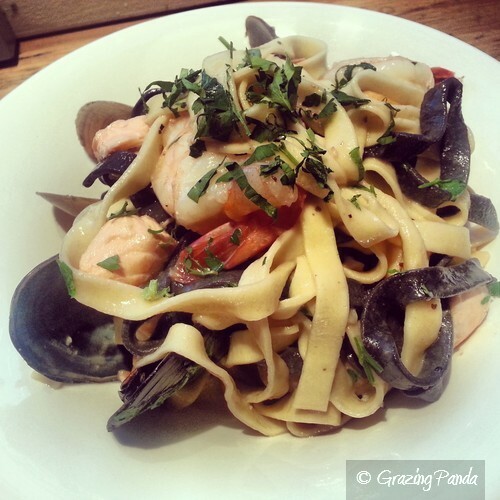 The Mess Hall – Favourite Seafood Pasta! I had been to The Mess Hall years ago – prior to me ever starting this blog and remembered that the food here was pretty good. So on the night of the Stereophonics concert, I needed a place for food and The Mess Hall happened to be near where they were playing. The Mess Hall is quirky and funky looking place complete with wooden tables and interesting accents in the form of decor around the place. The staff are friendly and welcoming. The food served is Italian style and they are open for breakfast, lunch, dinner as well as for snacks. The Mess Hall is a rustic and intimate menu and despite being simple is a great place to visit for a romantic occasion with its soft lighting. The menu is short and simple, with many dishes catching my eye but I settled on the Black & White Tagliatelle with Mussels, Prawns, Clams and Salmon. I have to say this has been on my favourite seafood pasta dishes ever! The pasta was perfectly cooked and the flavours were simple yet delicious. The Seafood was fresh and all cooked to perfection with each separate component complimenting each other. The serving size of the dishes are just as great as the actual food and are quite generous. I did also get to try out their coffee which was nutty and creamy. As we had to rush off to the concert, I didn’t get a chance to check out their dessert menu but from the sounds of it – it sounds delicious! I definitely do want to come back and try out some of their other dishes for dinner – but high on my list is to come here and try out their breakfast menu – the corn fritters sound great. Atmosphere / Ambience: Comfortable, Casual and Cosy. Really great for a dinner date with that special someone. For my birthday dinner with my group of friends I picked Gorski & Jones. This great restaurant is located in Smith Street in Collingwood and is brought to you by Paul and Linda Jones – who also head up Brunswick Street’s popular Alimnetari together with Meaghan Gorski (ex-Jacques Reymond, St Peter’s) and voila you get the name Gorski & Jones. It was Gorski herself who drew up the initial sketches to overhaul what used to be The Last Record Store (which had been here for the last 18 years) and gave the ideas over to artist David Murray. The result is a welcoming and warm room despite its high wooden ceilings – it is complete with bare brick walls, industrial lightshades which create mood lighting, plant boxes, an open kitchen with white tiles and the highlight of the kitchen – the wood-fire oven. The other main highlight of the room is the long marble bar with dark wooden pannelling. Atop of the bar is ever changing daily selection of antipasti which is displayed in a glass cabinet.You can walk through the main room through to the well constructed outside inside courtyard, so it’s a great place for all types of weather. The courtyard is long, homely and warm complete with its wooden floors and over-sized lights. The wait staff are just as warm as the venue is and are super-friendly and happy to help in any way. They knew it was a birthday dinner and offered the table a free glass of wine for everyone which I thought was a nice touch. The menu is split into 5 different sections – antipasto, entree, main, sides and desserts. We are all quite hungry so it doesn’t take too long to decide on what we want. There were some specials that were available as well – with the highlight amongst the table being the crackling pork. The fish of the day was a Snapper cooked whole. I was deciding between the fish of the day, the risotto and the gnocchi pasta. I decided to go with the gnocchi in the end. Whilst our food arrived we were given warm house made bread together with ricotta which was placed along with the olive oil. Something so simple yet tasted so good and everyone around the table enjoyed this addition of ricotta. Gorski and Jones was already off to a great start in terms of food. For starters we got a serving of the Zucchini Flowers – Stuffed Zucchini Flowers, Mozzarella and Peperonata. The Zucchini Flowers come in a tempura style covering and are stuffed with delicious creamy ricotta which comes atop of the peperonata. The dish is fresh and flavoursome and one of the better zucchini flowers I have tasted. There was a variety of different dishes around the table for mains. This ranged from lamb to chicken livers! There was Chicken Cacciatore, Pancetta, Kiplers, Olives as well as Pappardelle, Guanciale, Chicken Livers, Caramelised Onions & Radicchio. N had the pasta with chicken livers and thought it was quite a tasty dish, however couldn’t finish the entire dish as it was quite filling. S had the Roasted Lamb Rump with White Beans, Rosemary and Olive Tapenade – which was quite a generous serving and the white beans complimented the perfectly cooked lamb. M had the Saffron Risotto with Scallops, Peas, Dill and Lemon – of which I got to taste a portion of. The risotto was cooked well and had all the seafoody flavours from the scallops – the only feedback that both M and I would have was that there could have been more scallops added. L had the Fish of the Day which was the Snapper on this night ( I got to try a bit of this dish as well) – the snapper came with the bones attached and was flavoured with a lemon sauce with capers. The dish that I got for my main was the Ricotta Gnocchi, Broccolini, Pangratata. The gnocchi was quite tasty and perfectly sized – some pieces were tougher than others. I enjoyed the combination of the Broccolini and Pangratata (which is breadcrumbs), together with the tangyness of the tomato. The portion sizing might look small – but it definitely fills you right up. L&P both ordered the special of the Crackling Pig Pie with Potatoes and both loved the dish! If you have a look at the pictures of these dishes – the serving sizes were massive! It was safe to say that everyone around the table were quite satisfyingly full after each of their mans. The food was homely and delicious thanks to the fresh produce and the interesting combination of flavours. Some of us around the table decided to get dessert dishes and share them – we got the Squacquerone Panna cotta, Spiced Pear and the Hot Chocolate Pudding, Chestnut Ice Cream. We all wondered what squacquerone was – turns out it is a type of cheese – quite mild in taste and reminds me of a tangy version of mascarpone. I have never had a cheesy flavoured panna cotta before so was intrigued to see what it tasted like. This panna cotta was different to any other panna cotta I have tasted before – it had sour tang flavour to it that blended well with the vanilla bean taste of the panna cotta – put together with the spiced pear it worked effortlessly. This flavour combination is something that I am quite sure most people would never have tried – but definitely try this dish when you come to Gorski and Jones. The Hot Chocolate Pudding was another great dessert dish – warm and with a gooey chocolatey centre paired with the chestnut ice cream. A must for chocolate lovers. Gorski and Jones is a great venue for any occasion – be it a casual or more formal affair. It presents affordable dining in typical Melbourne surrounds that is warm and refreshing. The menu has an Italian influence with modern touches and is all round delicious. Next time you are in the area – come into Gorski and Jones – you really wont regret it! Atmosphere / Ambience: Funky, Fun and Casual. Great place to just chill out and enjoy some great food amongst friends. Service: Friendly, Warm and Receptive. It was a combined dinner for myself and V and the place that we decided on was Mister Bianco. Mister Bianco, which is named after a municipality in Sicily, is located on High Street in Kew and is amongst other restaurants such as Estivo and St Katherine’s in that strip. This great Sicilian restaurant is a stylish and romantic restaurant brought to you by Joseph Vargetto (Mezzo Bar & Grill) and serves food and flavours from Southern Italy. When you walk into Mister Bianco there is warm and welcoming feel to it – there is soft lighting and classy touches. There are two adjoining dining rooms – one at the front- where the wooden bar is housed with tables surrounding it – as well and one further behind which houses more tables. There is also extra space upstairs which includes a private dining room. It really is like a typical Italian Bistro Style restaurant, which further adds to the comfort and feel. The tables are decked out in crisp white linen, topped with monogrammed wine glasses and completed with a variety of salts and olive oil for the bread to come. There is abstract art work in bright tones that stick out on the white walled background, which is further emphasized from the soft glow of lighting. The menu comes from Vargetto’s extensive experience coupled with his traditional Sicilian roots and brings it together to form a modern take on Sicilian food – flavours, ingredients and cooking methods. The menu is divided into different sections – stuzzichini (little starters), entrees and mains and a separate heading for shucked shells, steaks as well as pasta and risotto, and finally sides. On the main menu there is also a box which is titled – “Save some room for dessert” which I think is quite a good idea. I mean who doesn’t have room for dessert? There was 6 of us at dinner so we decided to share a combination of stuzzichini and entrees and then get a main meal each. Yes, we were all really hungry on this day! First we recieved the Our Meatballs ‘Messinese’, Cous Cous + Tomato Sugo. The others really enjoyed these meatballs which also had a hint of chilli and paprika which enhanced the tomato and meat flavours. The Cous Cous comes with pine nuts, sultanas and saffron and was cooked perfectly and was the great addition to the meatballs. We also ordered the Arancini of Blue Swimmer Crab + Stinging Nettle with Romesco Sauce. The Arancini was perfectly crumbed and was crunchy and tasty with a soft gooey centre of crab. The Romesco Sauce was a strong flavour but with the addition of the lemon gave a great tang and lessened the flavour. A tasty dish all in all. Next up was the Burrata Mozzarella (money bag style), Roasted and Raw Heirloom Beetroots, Candied Walnuts, Grissini and Balsamic Reduction. I was intrigued by this dish as the Mozzarella on the menu stated that it was money bag style and indeed when it came out it did resemble a money bag and was the centre piece of the dish. It was surrounded with the other ingredients, with the Grissini topping the dish off in criss cross style. The combination of the mozzarella, beetroot with its sweet taste coupled with the tang of balsamic reduction and the walnuts was delicious. It was a really interesting dish and a great light entree. The last share dish we had was the Tuna Carpaccio ‘Alla Zingara’, Avocado Puree + Cucumber, Fennel Bread. This was a spectacularly presented dish – the tuna is seared on the outside and comes in the form of three mini hamburgers. There are three tuna pieces which make up the hamburger and are sandwiched between tomato, cucumber and avocado. The tuna “burgers” are topped with sesame seeds just like a real burger would be. Its little details like this that make a difference. Surrounding the “burgers” are shaved bottarga, pistachios, fried capers and greens, together with fennel bread. This is really a fantastic dish and a must try! For mains there was a variety of dishes chosen but the clear favourite was the Hand Cut Cavalo Nero flavoured Tagliatelle, Poached Spanner Crab and Grilled Scampi, Chilli, Garlic with three of us selecting this dish. And this dish certainly didn’t disappoint – the pasta (all hand made) was fresh, tasty and green as it was flavoured with cavalo nero. The flavours were rich and full of flavour and just yum – my one comment would be that there wasn’t much poached spanner crab in the dish and there was heaps of oil around the dish. I love how the dish was topped with grilled scampi and it certainly was the highlight of the dish – it was once again cooked perfectly and flavoured nicely. Another dish around the table was the Potato Gnocchi with Slow Braised Organic Chicken, Farmed Rabbit, Corn Ragu and Crispy Parsnips – the pasta once again was soft and fresh and literally melted in your mouth. What caught V to pick this dish was the corn ragu – it was an interesting concept to the dish. She enjoyed the dish and as gnocchi dishes usually are was quite a heavy dish – the addition of both the chicken and the rabbit intensified this. C ordered the Slow Braised Organic Beef Cheek in Red Wine, Creamed Spatzle and Pickled Raddichio – which was another impressive dish. The Beef Cheek was glossy and cooked so the point where it literally fell off the “bone” and coupled with the creamed spatzle and tanginess of the raddichio was delicious. H ordered the Slow Cooked Otway Ranges Pork Belly with Peppers, Capers + Raisins, Sauce ‘Agrodolce’ – which he enjoyed quite a lot as well. Next up was dessert – and since there was 6 of us we decided to order 4 different desserts and share them all. This way we got to sample and try a variety of what they had to offer. Desserts are done by pastry chef Maria Lantelme. The first of the four desserts was the Sicilian Style Donuts with Chocolate Gelato + Strawberry Jam. This has to be one of my favourite dishes as of late – the most interesting part of the dish was that it came with a syringe of jam which you use to inject the jam into the donuts yourself. I love this concept – its a bit different and allows you to interact with the food in a different sense, rather than just putting it in your mouth and eating it. The donuts itself were warm, delicious and had the right amount of sweetness topped with icing sugar. My only qualm would be that more jam was needed – perhaps two jam-filled syringes? =p The next dessert we tried was the Our Pineapple “Sundae” – Pineapple Carpaccio, Prosecco Jelly, Roasted and Glazed Pineapple, Pineapple Sorbet – it was all about the Pineapple. It came out in a martini glass that was covered with pineapple pieces on the outer edge and topped with a scoop of vanilla ice cream. The different ways that the pineapple had been encapsulated was interesting and it was quite a sweet tasting dessert. The other two desserts were the Strawberries + Cream Soufflé, White Chocolate Chips + Strawberry Sorbet + Raspberry Crisps and the dessert special of Orange Almond Sponge Cake with Creme Fraiche. Both of these desserts were exceptionally tasty as well. The souffle was warm and gooey and the sorbet oozed with the tangy and sweet strawberry flavour. The Orange Almond sponge cake was moist and full of the orange flavour, with the creme fraiche helping to smooth out the strong orange flavour. Overall, the staff are friendly and always helpful – just a pity on the night it seemed quite hard to get their attention when we wanted to order a drink or something off the menu. The place is soothing, calming and generally all round cozy and serves up great Sicilian food with a modern twist. Atmosphere / Ambience: Comfortable, Cosy, Romantic – great for date night or celebrating that special occasion. Service: Friendly, Welcoming and Knowledgeable. Just a note on the night that we went – there were about 3 waitresses – but it just seemed hard to get anyone’s attention at times if we did need something – but having said that they were really great in ensuring that our glasses were always topped up. Bowery to Williamsburg is new to the cobblestone laneway of Melbourne namely Oliver Lane (which also houses the famous Coda) – is known for its fantastic bagels and out of this world sandwiches. In this downstairs area there is also a large marble communal table with interesting chairs that you need to come early during the lunch hour to secure a seat. There are also other single tables around the place. The menu (as you can see from the above picture) comes on little cards and outlines exactly what is in each sandwich and the different sides that you can choose from. There is also a wooden wall with chalk boards that have the menu on it as well. There are 10 different sandwiches to choose from – covering all bases from – mushrooms to salmon, to corned beef to pork and almond meatballs. The combinations are fresh and ingenious! Here they also cater for people that would require gluten-free bread – this will cost $1 extra. Breakfast time is when the bagels are available – there are several varieties of bagel on offer – both savory and sweet – all made by 5 and Dime. Options include the sour cherry bagel with a smear of lemon curd, or perhaps a beetroot and rye bagel with cream cheese. There are cooked breakfasts too, like poached eggs with maple baked beans and a bacon slab. To add to this there is your something sweet which sits in the cabinet and the counter such as Key Lime Pie and Maple Pecan Pie. Our waitress comes over and explains the special sides that we can order and takes our drinks order. I have to say now I am not a fan of peanut butter at all, but the sound of a peanut butter hot chocolate is tempting as does the Mofo Deluxe Hot Chocolate. I decide to give the Peanut Butter Hot Chocolate a go and I am so so so glad I did! It is one of the best hot chocolates that I have had and what makes it better is that it comes with a mini Reece’s Peanut Butter cup on the side! It comes served in a faux crumpled plastic cup and is so rich and chocolately and just simply delicious. If you are game you can add your mini Reece’s Butter Cup into the hot chocolate for more gooey yumness. Another point to note – coffees come out with a Hersheys’ Treat. For lunch I decided to go with sandwich combo and get the pretzels, dill gherkin and a side – I mean why wouldn’t you – it just sounds and looks oh so good! I go for the Field Mushroom sandwich with pomegranate tabouli and minted yoghurt – and as my side I choose the Mac ‘n’ Cheese. I came with A and she ordered the Meatballs Sandwich on its own which comes with Pork & Almond balls, Harissa Tomato Sugo and Mozzarella. My sandwich was delicious – the mushroom was juicy and fresh and the addition of the tabouli and minted yoghurt with the bursts of pomegranate provided the tanginess and the acidity. Having a bite of the pickle added another depth to the meal. The Mac ‘n’ Cheese was warm and tasty and served off to the side in its own little jar with the cheese melted messily around it. I loved this concept. The whole meal came plated out on a wooden board. The staff are friendly, welcoming and chirpy and are always willing to help you decide on menu. I will definitely be frequenting this place even though there might be lines – I think it’s worth the wait! The food brings together interesting combination of ingredients and is fresh and tasty. I really want to come back during breakfast time and try out the bagels and check out the breakkie menu as well. Bowery to Williamsburg is a homage to the underground station that is New York and really does bring that part of the world to what is typically a Melbourne laneway and is a great cafe / takeaway place. Standout Dish: Any of the sandwiches really! Peanut Butter Hot Chocolate! Online Booking: No – seating is first in, first served. I suggest getting there at 12pm in order to get a seat during lunch hour.